The weekend would be defined by the annual event that takes place in Northern California; the Redwood Run. This is the largest gathering of Harley Davidson motorcycles in the world outside of Sturgis, South Dakota. Tens of thousands of Harley fans would choke Highway 101 on this June weekend. Beer would rival the flow of the Eel River in Mendocino County. Mark Wolfe was the only volunteer willing to drive the four hours to Ferndale (near Eureka) to drop me off. 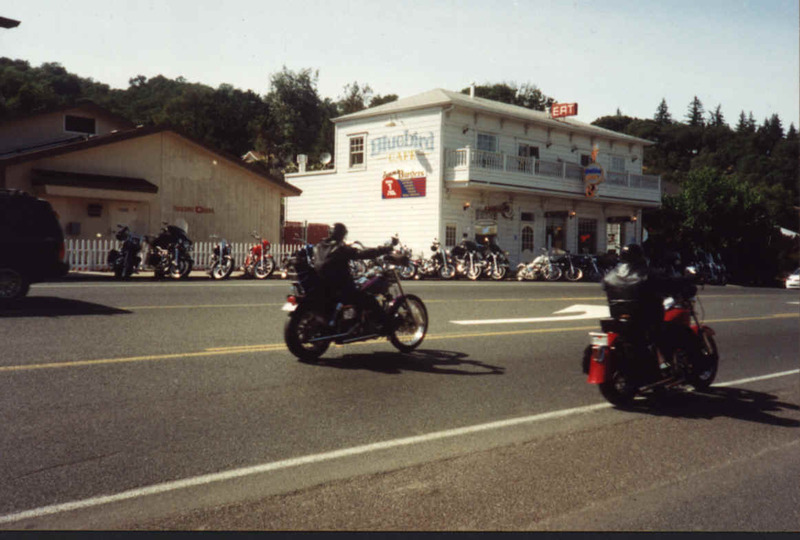 We left Calistoga Friday afternoon, drove leisurely to Hopland, enjoyed a beverage at the Hopland Brewery while the din of motorcycle noise steadily grew to a dull roar. From the parking lot at the Salooz Bar, a hefty, over three hundred-pound biker repeatedly performed wheelies down the middle of crowded 101 between nearly stalled lines of traffic. This one biker captured the essence of the event. Mark and I motored north along the beautiful Redwood corridor. 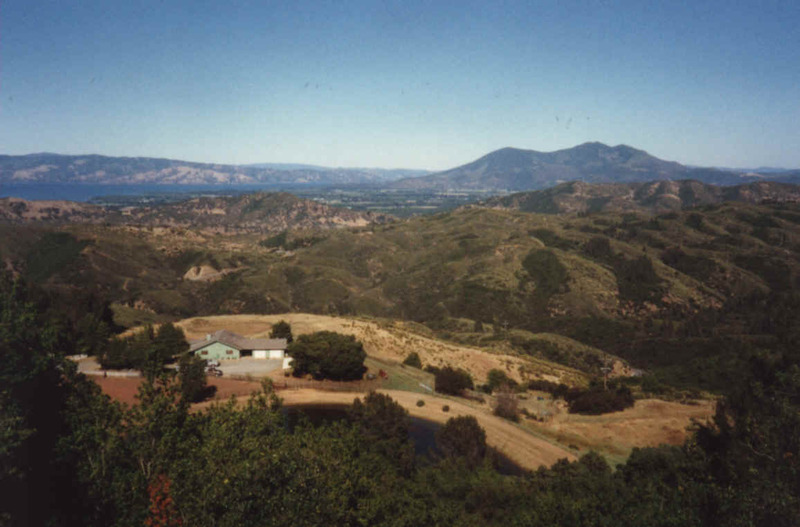 Once past Ukiah, the terrain becomes notably more mountainous. The road climbs and falls, twists and turns between curtains of majestic trees. The beauty is tempered only by the knowledge that just out of sight, a moonscape of devastation exists where the greedy timber companies have shaved the forests and scorched the land after all the trees were down. In the town of Redway we discovered the Eel River Cafe. This small town restaurant served us a memorable meal as the evening became long. We had to consider where we would spend the night. Our first thought of staying at the State Park system seemed like a long shot due to the summer traffic, being on a weekend, and during the Redwood Run. To our delight we found space available at the Burlington campground in the Humbolt Redwoods State Park. Having an approved place to sleep makes the evening more comfortable. There was very little moisture in the air and the usual fog was absent. We awoke early and motored through the flagging towns that once hosted a bustling timber business. Within an hour we pulled into Ferndale, found Papa Joes restaurant. This establishment was obviously the haunt of many locals. Several groups of people huddled around tables exchanging friendly banter. The food was probably the worst breakfast on record. It was apparent that the menu wasnt the attraction to Papa Joes. After the very marginal meal, we sauntered over to the Kinetic Sculpture museum. Here, many artifacts from thirty years of serious frivolity adorn the interior of the building. The rigs range from small single seat contraptions, to monstrous machines that were propelled by a dozen people. Among the most interesting was the CHP Cadillac. 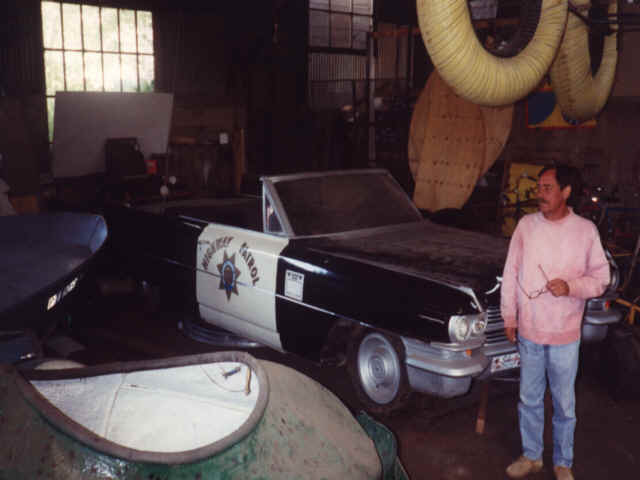 It was a replica of a 62 Caddy that was pedaled by four CHP officers. By ten oclock the duo was ready for the next phase of the adventure. 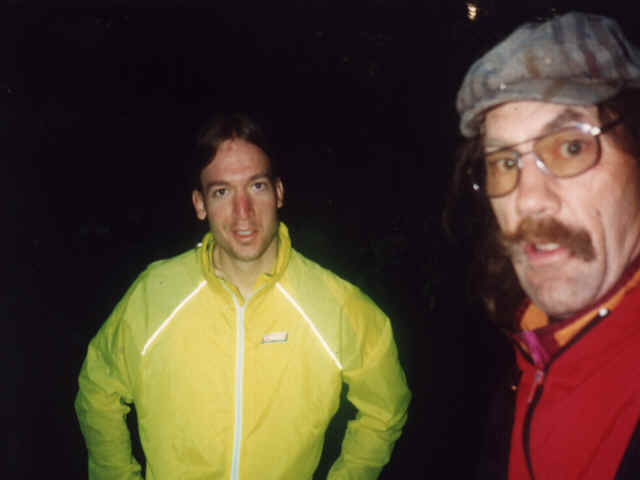 Mark would point the Toyota towards Calistoga and I would begin the first mile of the three hundred that would eventually take me home over a four-day period. As I mounted the touring bike for the first time, I immediately had a nervous feeling. I was trying several new items for this tour. First I was trying to travel light. I had removed most of the peripheral appliances from the bike. I wouldnt need the headlight, the fenders, and the front rack. I had all of my gear in two small panniers with my sleeping back and ground pad on the top of the rear rack. I didnt bring cooking utensils or rain gear. Although the bike was relatively light, it initially had an unstable, aft heavy feel to it. In addition I was running high pressure 25 X 700mm tires. The skinny tires would require extremely careful riding. Any notable pothole could trigger a double flat. As I left Ferndale, the wind was blowing at a ferocious rate from the west. At first it was a tricky cross wind, making me work to gain steerage towards Fernbridge where my course would turn south. Within the first two miles I became accustomed to the different handling of the bike. My last tour was on a mt. bike pulling the B.O.B. That rig was exceptionally stabile. This rig though slightly twitchy was quick. I would make much better time than I had figured was possible. The tailwinds helped. The first notable landmark was the town of Rio Dell. I exited the freeway and cruised town. I stopped at the market and got a couple of items I would need later. One of my greatest fears was having to share Highway 101 with traffic. I was very pleased to discover that the Avenue of the Giants paralleled the highway for much of the distance to Leggett where I would turn towards the coast. After Rio Dell, the town of Scotia was the next landmark. This company town is run entirely by the Pacific Lumber Company. The company was once a reasonable model of forest management. But Charles Hurowitz and his MAXXAM Corporation changed all of that. They came in strictly interested in the money. The forest, the ecology be damned. Charles Hurowitz represents the worst in human tendencies. It is shortsighted greed paid for by long term devastation of beautiful virgin forests. These magnificent, ancient trees are sacrificed so that a handful of people can enjoy a redwood deck for a few years before it ends up in the landfill. To chop down a tree that is over one thousand years old so that it can be put in the dump within a couple of decades is obscene at best, and criminal in the larger scheme of things. The Avenue was peaceful and enjoyable. My only company was dozens of Harleys who putted at reduced throttle through the awesome woods. Even though it was Saturday, the traffic was light. Even the freeway nearby didnt have much traffic. For most of the ride to Garberville, the highway does very little climbing. The nearly level terrain threads its way through the valleys as it heads inland from Ferndale. By now I felt a sense of relief with my bike. The weight on the back was not so great and the handling was fine once I adjusted for the loading. It was still a complete mystery as to how far I would be able to travel each day. My usual touring rate comes out to be around 12 miles per hour. Today was no exception. By mid-afternoon I was approaching Garberville. The number of Harleys had steadily increased as I approached the temporary Mecca of Harleydom. Chaos reigned as I entered town. There was much noise, lots of beer drinking and a live band playing on the closed off streets of downtown. I bought a double mocha at the coffee shop and sat outside taking in the spectacle. It was entertaining. The constant roar of V-twins filled the downtown. Dozens of groups of leather clad people stood around in happy conversation. Every possible type of Harley was represented. There were brand new versions and ancient, beautifully restored bikes on hand. There were colors that stretched the rainbow. There were fat, grizzly looking characters and there were the lawyer/business types riding the assortment of machines. There were babes on bikes and there were even dogs on bikes. Re-energized with caffeine I got back on the bike and pedaled through the downtown, feeling a distant comradeship with my fellow two-wheelers. I had made nearly fifty miles. Earlier, I had allowed that Garberville would be an OK distance for the day. Yet, it was only mid-afternoon and the possibility of making it to Leggett loomed within my thinking. The winds continued to blow stiffly at my back. I made several miles out of Garberville with relative speed. Several miles down the road I came across the main encampment for the event. 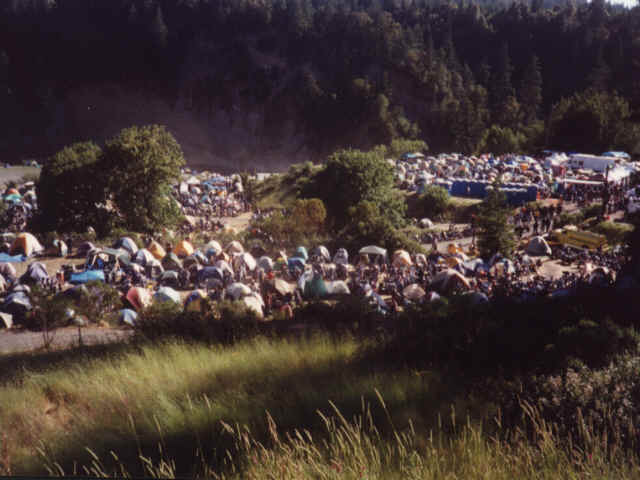 Thousands of tents, job-johnnies and Harleys littered the hillside. The riding thus far was a delight more than I had anticipated. The combination of ingredients created an alchemy that ushered in a full day of joy, freedom and just plain feelin good. The bike was handling exceptionally well once I became used to the weight and whippy nature of the large, cro-mo touring bike. The Gran Tourismo was loose but much more efficient with its fresh, new 700-mm wheels and tiny tires. The rigid aluminum Trek that I took on the Big Sur run was utilitarian but ultimately not as quick or comfortable. As I pedaled south, I began to consider where I would spend my first evening. I considered making the turn on Highway 1 then camping. But I discovered that the Standish-Hickey State Park just before Hy.1 had camping available. 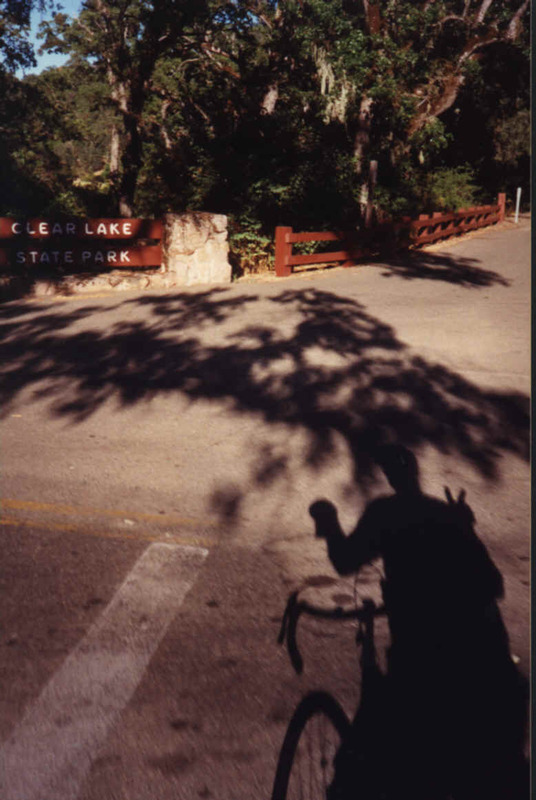 Being partial to campgrounds, I gladly checked in for $1.00, the standard fee for hiker/biker campsites. The bad news that the hiker/biker campsite was right next to the bathrooms. California has a bad reputation for the bikers. 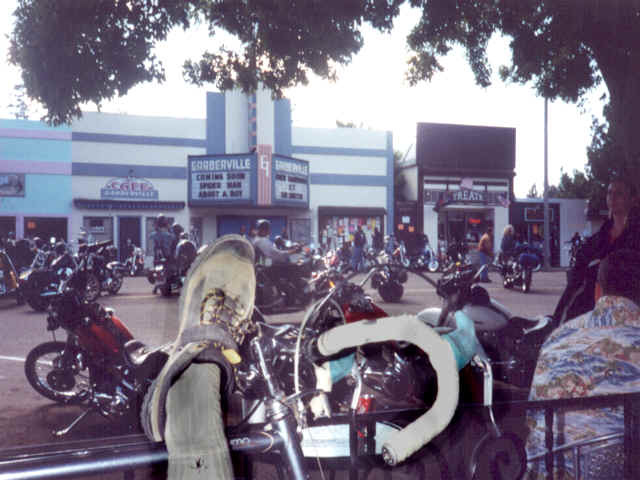 Someone in Sacramento must have thought of Harley riders when the state mandated areas for bikers, and as such, gave us the worst spots available in the campground. Two nights hence would prove the point with an even worse offering from the State of California. I might add that Oregon (on another trip) was sensational in their generosity with groovy camping sites for the hiker/bikers.Two other adventurous souls shared the campsite. Greg was into his fourth day on the way to a lifetime of glory. He was headed north and was out for the big one. He would travel the entire continent and back again. Greg had done all the right things. He got an education, a good job, worked hard and lived frugally so that he could save his resources for a slice of life that will never be replicated in the work-a-day world. 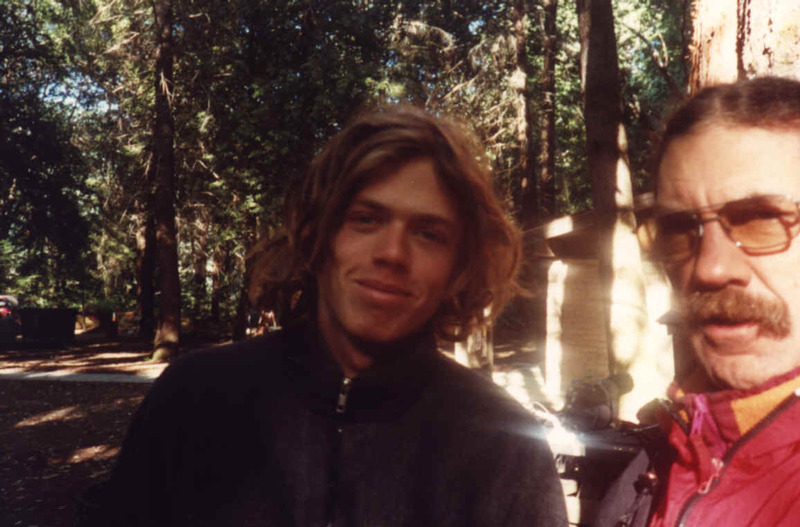 Jared kind of represented another end of the growing up scale; youthful, adventuresome, impulsive and finding a way to thrive with very little means. He was headed south to San Francisco. He had a deadline of four days in which to pull off the feat. In our talks, we both felt we would make it to Mendocino the next day and stay at Russian Gulch State Park. Both bikers and myself shared a common bond. Being on the road, on a mission gave us each a special insight and language about our unique daily living while touring. Each person has their own way of dealing with the supplies that are needed for comfort and support. At minimum one must take clothing appropriate for a variety of conditions and one must have protection from the night cold (sleeping bag). Beyond that a whole spectrum of possibilities exist. On my last trip I took my B.O.B. The Beast Of Burden trailer is capable of hauling many pounds of gear with 'relative' ease. In that mode I have all the comforts of home; kitchen, tools, tent, cloths and lots of food. Much of the day is spent organizing, fussing and frittering with hundreds of gadgets and stuff. I was packing light on this run. A tarp, ground pad, a sleeping bag two small panniers were all on the rear rack. I carried very little food. I had a few cliff bars, trail mix and some granola. I passed plenty of stores and restaurants that had good food. There was no need to pack more. Most of my stuff was behind me with no panniers on the front of the bike. The aerodynamics proved great as I was able to cruise at a noticeably faster rate than with the B.O.B. or front panniers. I slept gloriously well. I noticed first light and lounged for another hour in the ozone, somewhere between sleep and morning. I heard Greg get up and start packing his gear. 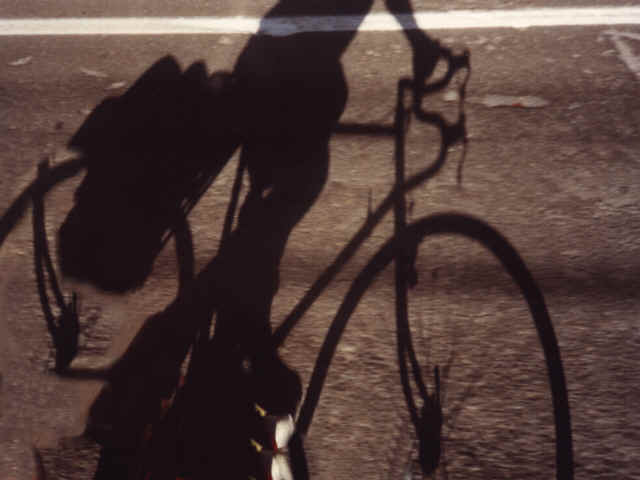 His intention was to be on the road early to avoid, somewhat, the blistering headwinds that he faced. Jared would snooze in, taking the day to have an easy, laid-back cruise to Ft. Bragg and Russian Gulch State Park. Somewhere between the two, I packed my bags and pedaled into the town of Leggett. There was a great restaurant at the outskirts of town. It was run by three generations of women. When I first arrived, I could see the place filled but the door was locked. It turned out that they were having a power outage and were running on a generator. This situation greatly diminished the capacity of the kitchen. Shortly I was let in for a delicious and power packed breakfast of French toast. The meal would power me most of the way to Ft. Bragg, about 44 miles over the coastal mountains. The ride from Leggett to the coast is beautiful on a bicycle. If one is in a hurry, in a car, it is easy to see that this road would be a pain in the rear. The never-straight highway climbs abruptly out of Leggett and the valley that hosts Highway 101. The formidable barrier of mountains parallels 101 from Rio Dell to Santa Rosa before much relief is available to get across this topography. There are many climate zones. The nature of the flora and fauna change slow as the cyclist, a foot at a time, ascends through two thousand feet of ever varying terrain. Then the biker gets to revel in the rewards of long, hard work. The ride to the coast is mostly downhill, with one notable exception. A five hundred-foot climb makes this biker start to think about the brewpub in Ft. Bragg. 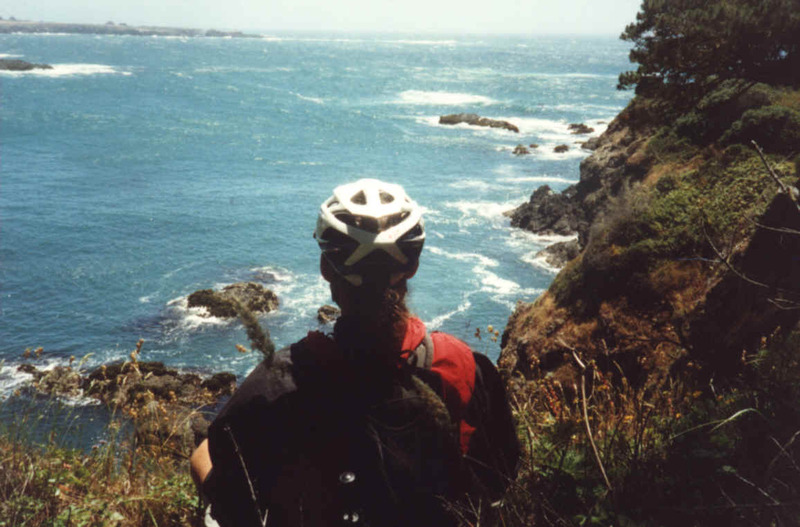 At the outlet of the final descent, sensational, "Kodak moment" views of the Pacific Ocean titillate the eye. I had a little tiredness setting in. I had covered thirty miles of tough terrain, yet it was only about 12:00 noon. The rest of the spin to Ft. Bragg was a breeze literally! Strong tailwinds kept my speed in the twenty-mph range allowing the miles to sail by at a great rate. The coastal highway along this section before Ft. Bragg is mostly flat with a handful of small climbs. Beer and sandwich thoughts began to flood my brain. The last few miles into town became a little labored. Finally I sat down on a chair. After the tiny bike seat, the chair felt divine. To my delight, the bar television was showing soccer. I ordered a stout and quaffed two thirds of it in one gulp. For a brief moment, my pleasure senses crossed the line into nirvana. The beer tasted heavenly. It could have come from Aphrodite's breast. (Except for the carbonation. Aphrodite's offering doesn't likely produce huge and expansive belching) My ears continued to ring from hours of elevated effort. My entire body buzzed. It was a good buzz. I ordered a burger. It too, turned out to be a taste and feeding experience that rivaled anything I've done so far. All of the ducks of my culinary world were lined up for that tasty, wholesome burger. It was festooned with most of a vegetable garden. I added copious amounts of ketchup and mustard. I savored every bite. I didn't even slow up and went straight to the French fries, a carbohydrate heavy hitter. For a period of time I sat. I was full and feeling much like going to sleep. 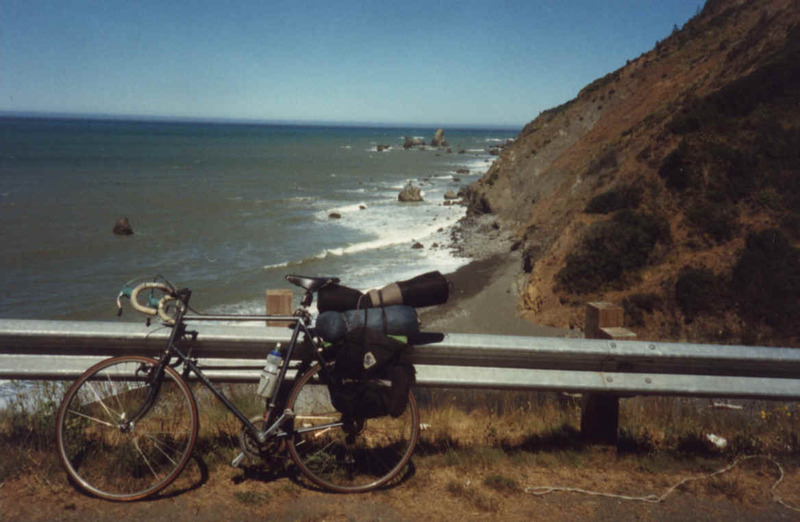 I eventually rallied and pedaled down the coast to Russian Gulch. There I found an ocean scene that was superb. The waves crashed and danced about the rocks. Streamers of seaweed sashayed in the foamy, blue-green water. Seagulls and water birds vigorously darted about in the mid-day sun. The intense ocean sounds were mesmerizing. I searched for a comfortable place to sit at the top of the cliffs. For the better part of an hour I dozed in and out of sleep. When I awoke, I began to feel some energy, some power. I knew that if I stopped at this time, I would be bored and restless. I still had over six hours of daylight. I decided that I could make it to Orr Hot Springs resort near Ukiah. It was thirty miles to the east with climbing back over the coastal mountains that I crossed westbound in the morning. My final thought as I hit the road was that I wouldn't see Jared again this evening. I hope he made it to the Gulch and enjoyed the better scene. Immediately upon setting out is a significant climb to the plateau that overlooks the town of Mendocino. After twisting and winding uphill, the road straightens and climbs at a very moderate rate. Again I was blessed with a significant tailwind. I was able to chew up miles rapidly until the town of Comptche. I was longing for a tasty fruit drink, but the store was closed. I had enough water to continue. The climb up and out of Comptche was difficult. I was tired now, having covered nearly seventy miles. The road was again lined with natural beauty. The only item I found to be less than beautiful were the two rotweiler dogs that found me as a welcome break in their otherwise boring day. They chased me with vigor. My reverse psychological tactic of being nice and inviting them along failed completely. They forced me to sprint uphill for at least two hundred yards before letting up. One dog I can handle. Two can be scary. This final blast of energy would propel me slightly faster to my destination, Orr Hot Springs. The sun was low in the afternoon sky as I pulled into the resort. 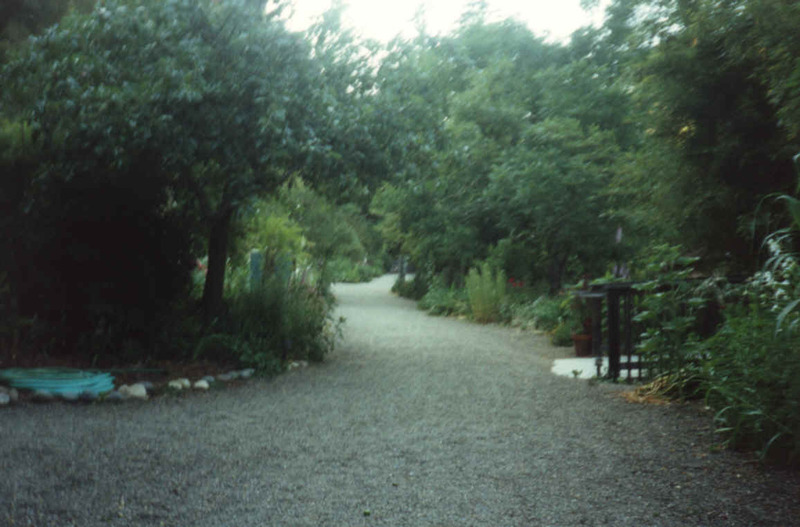 The lovely gardens instantly sweetened the atmosphere. I asked about camping, there was room. I selected a campsite. It was within earshot of a burbling stream. I set up my camp then retired to an evening of lounging in a wonderful variety of hot pools. The ancient, soothing waters refreshed my worked body. I could feel the miles melt away as I drifted into the pleasure zone once again. After a great night of sleep I had to face my first task. I would have to climb over the coastal barrier again. Similar to the previous morning, this climb was significant. I eventually topped out and rocketed downhill on good, smooth pavement into Ukiah. Now hungry I shopped for a power breakfast. I found another delightful meal at Schatt's Bakery. Not only did I find incredibly tasty breakfast treats but also met Zack Schatt, a dedicated and experienced bike rider. We exchanged a few quick stories before I left. On the way out the door he handed me a few pastries that would power me for most of the day. With calories on board I headed over to Jen and Sumo's house for a brief visit. With insider directions, I headed to Eastside road. Once contacted, the road proved to be a delightful, low traffic route through the same valley that 101 serves. The route meandered through lovely farmland (now mostly vineyard) with quaint old homesteads still standing. The scourge of grapes was clearly taking its grim toll on the land. What was once reasonable farming with animals, crop rotation, varied crops and use of only flat land, is now a creeping monoculture of the wine industry, marginally qualifying as agriculture. After twelve miles, East Side road connected with Highway 175 at Hopland. Now I really began to feel close to home. Tanya and I had ridden to Hopland twice on our tandem. Now I could say that I have ridden from Astoria OR. to Calistoga, CA. In fact I had now covered Astoria to Cambria, CA. 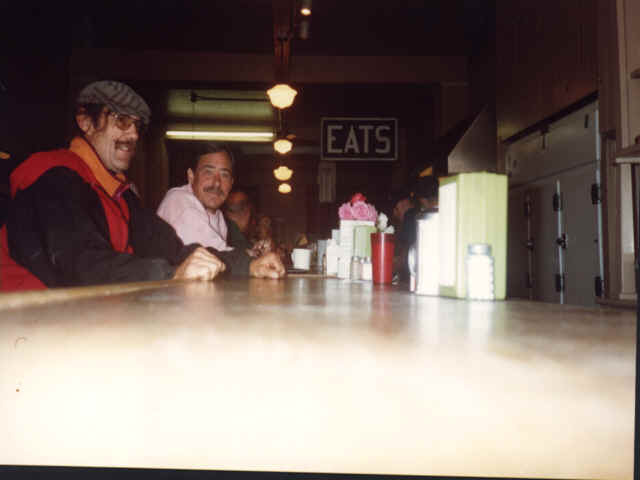 both locations of relatives. I stopped in Hopland to buy some WD-40. I had promised my bike that I would lube the chain early in the trip. I never seemed to remember. With my newly lubed chain I was ready for the next assault on the mountains. Highway 175 heads southeast over very high terrain. The climb is nearly 1500 feet. At the top one gets a spectacular view of Clear Lake. I was tired. I could see my destination on the western shore of the lake. The State Park was about twenty miles away, but many of them were downhill. I stopped in Lakeport to buy a couple of items. For six dollars I scored a deli chile relleno, coleslaw and yogurt. This would prove to be another tasty and nutritious meal. I headed out the eight miles to the park. I was ready to be there several miles before I actually arrived. To my surprise, there was no ranger on duty and the campground was nearly empty. Clearlake State Park is a hidden gem in California. It sits on Kelsey Creek where the creek empties into the lake. There is an abundance of wildlife. Huge bullfrogs croaked so loud at night, they nearly kept me awake. Birds abounded, including a nesting pair of Ospreys. They had built their nest smack dab in the middle of the picnic area. Eventually I came out on Highway 29. I stayed on 29 less than a mile. I turned off on Seigler Canyon road. This would lead for nearly six miles to the intersection of Big Canyon road. There I was on familiar turf. It is only ten miles to Middletown on a road that I had ridden many, many times during my 10 years living in M-town. I passed by Hoberg's Airport. Many decades ago, Humphry Bogart and Lauren Bacall would fly into this remote strip and party at the resorts once famous in this area. I stopped for a few minutes to be quietly with the stream and its lovely surroundings. I had stopped here before and knew of the special quality of the spot. It was refreshing and invigorating. I arrived in Middletown by noon. I was hungry and went directly to Perry's Deli where Linda made me an outstanding sandwich. Coupled with a beer, I was once again in culinary pleasure zone. I rested only briefly before deciding that I was too close to home to finish. I hastily rethought my afternoon and decided to cruise through Pope Valley. That would add a few easy miles and get me to Calistoga near happy hour at the Calistoga Inn. As I approached the turn at Ink Grade, I again changed plans. I reasoned that by going further to Chiles Valley, I would not have to climb the tough grade to Anqwin. That had an appeal since I was cruising easily on the flats. The bike was working well, the day was beautiful and I was still in the zone. For several miles I wasn't sure that I made the correct turn, having not ridden this road ever in this direction. But my fretting failed to bear bad fruit when I finally recognized the Lower Chiles Valley turnoff. Now I got to rocket downhill all the way to Lake Hennessey. I finally entered the Napa Valley after nearly eighty miles for the day and three hundred miles for the trip.